As is the case with couples, so it is with neurons and astrocytes: To function well, they must keep lines of communication open. Listening in on those conversations, scientists found out that when astrocytes attack motor neurons in amyotrophic lateral sclerosis, they do so with a one-two punch of destructive signals, according to a paper in the February 29 Nature Medicine online. First, the astrocytes secrete an as-yet-unidentified molecule that weakens neurons by eliminating some of their surface proteins. This primes the neurons to fall in the second onslaught brought on by yet more astrocyte factors. But neurons have plenty to say to astrocytes, too, even in healthy tissues. According to a study in the February 19 Science, neurons secrete a signal that molds astrocytes to their needs. This signal is none other than the protein sonic hedgehog. Astrocytes, like neurons, come in diverse shapes and perform multiple tasks. What determines their subtypes? One influence is the local environment that astrocytes settle in as the brain first develops (see Muroyama et al., 2005; Hochstim et al., 2008). But this cannot be the whole story, said Keith Murai of McGill University in Montreal, senior author on the Science study. He noted many instances where very different astrocytes sit side by side in the brain. To figure out how that could happen, first author Todd Farmer and colleagues focused on the mouse cerebellar cortex, which contains two main types of astrocytes: tree-like Bergman glial cells and star-shaped velate astrocytes. The former wrap their branches around the dendrites and synapses of Purkinje cells in the cerebellum’s molecular layer; they also express glutamate receptors and transporters. 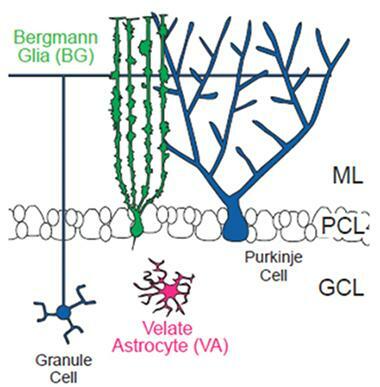 In contrast, velate astrocytes are compact; they express low amounts of glutamate-binding proteins but copious aquaporin 4. Velate cells support granule cells and mossy fiber glomeruli in the granule cell layer (see image above). To determine what distinguishes these two populations, Farmer surveyed the Allen Brain Atlas and the Gene Expression Nervous System Atlas, both of which detail gene expression across the mouse brain. He discovered that Bergman glia typically express genes that respond to sonic hedgehog, whereas velate astrocytes rarely do. The molecular layer is also enriched in sonic hedgehog, leading Farmer to hypothesize that the cell signaling molecule helped Bergman glia maintain their identity. To test this idea, he first made Bergman glia impervious to sonic hedgehog by deleting, from adult mice, the gene encoding Smoothened. This protein carries sonic hedgehog signals from the cell membrane receptor to downstream effectors. He found that while the glia kept their shape, many proteins were up- or downregulated, and immunolabeling revealed protein expression patterns uncannily like those of velate astrocytes. “The more we looked at these cells, the more we realized they had undergone a profound molecular program change,” Murai said. Farmer then inverted the experiment, expressing an always-on Smoothened mutant in velate astrocytes. The cells kept their basic shape as well, but started to express Bergman glia markers such as glutamate receptors. Cerebellar neurons use sonic hedgehog to “customize” nearby astrocytes to meet their needs, Murai concluded. Other factors might cooperate with sonic hedgehog to specify astrocyte types, as well, commented Beth Stevens and Allie Muthukumar of Boston Children’s Hospital in a Science editorial. “The study by Farmer et al. firmly supports the idea that cellular function is not solely defined during development but continues to be defined and regulated throughout adulthood, bringing to light a previously unappreciated form of cellular plasticity in the brain,” they wrote. Murai plans to examine neuron-astrocyte communication in models of diseases such as Alzheimer’s and epilepsy. He speculated that if unhealthy neurons alter expression of sonic hedgehog, then astrocyte responses might become harmful. If astrocytes stopped making glutamate receptors and transporters, too much of the neurotransmitter might accumulate in synapses, leading to excitotoxicity. The lab is also using known small molecules to activate sonic hedgehog signaling, in hopes that it will prompt astrocytes to turn on glutamate-processing genes and clean up diseased synapses. Researchers led by Brian Kaspar at Nationwide Children’s Hospital in Columbus, Ohio, analyzed a different form of communication—that between astrocytes and the degenerating motor neurons in ALS. Kaspar and other researchers have found that astrocytes derived from people with ALS secrete a mysterious factor that leads to the demise of co-cultured neurons (see Feb 2014 news; Aug 2011 news). In Nature Medicine, joint first authors SungWon Song and Carlos Miranda report that astrocytes first weaken neurons by telling them to stop making MHC Class I proteins. Then, they go in for the kill. The major histocompatibility complex Class I is best known for its role in the immune system. Its member proteins sit on cell membranes and present bits of protein to T cells for inspection. If the T cells recognize the peptide as being “self,” they leave the MHCI-presenting cell alone; otherwise, they destroy it. In the central nervous system, MHC Class I molecules also participate in other clean-up tasks, such as pruning unwanted neurites, controlling the size and number of presynaptic vesicles, and regulating synaptic plasticity (Huh et al., 2000; Lee et al., 2014). In mouse models of ALS, expression of MHCI has been linked to slower disease progression (Nardo et al., 2013; Staats et al., 2013). Therefore, Kaspar and colleagues wondered how MHCI might affect the fate of motor neurons at the hands of astrocytes. First, they compared MHCI levels in the spinal cords of people who had died of ALS with those from non-ALS controls. They also examined spinal cords of mice expressing the mutant human ALS gene SOD1. They were struck by the absence of MHCI in the human ALS or mouse SOD1 motor neurons (see image above). The difference was so stark that the researchers were unable to stay blinded to sample origin, said Kaspar. It was always obvious when samples came from ALS cases because the motor neurons were devoid of MHCI. Next, the authors asked if the motor neurons banished MHCI on their own, or if astrocytes were involved. They derived motor neurons from the stem cells of wild-type mice and mice expressing mSOD1. Both produced similar amounts of MHCI. When the researchers added mSOD1-expressing mouse astrocytes, the neurons’ MHCI expression dropped. The same thing happened when the authors added astrocyte-conditioned media to pure motor neuron cultures. The findings suggested that astrocytes secrete some signal for neurons to withdraw their MHCI. Kaspar theorized that losing MHCI rendered the neurons vulnerable to astrocyte attack. To test this, the authors overexpressed MHCI molecules in the mouse motor neurons before adding mSOD1 astrocytes. “It was surprisingly protective,” Kaspar said. They did the same experiment with motor neurons derived from the iPSCs of six different people with ALS. In every case, the extra MHCI protected the neurons from the toxic effects of human ALS astrocytes. Extra MHCI protected mouse motor neurons in vivo, as well. 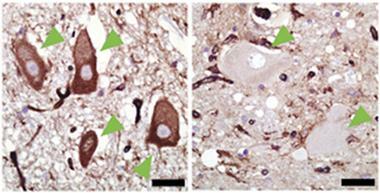 The authors used adeno-associated virus, which specifically targets motor neurons, to deliver the MHCI gene to mSOD1 mice one day after birth. As the mice aged they scampered more easily about their cages and balanced better on a rotating rod than did age-matched controls. While mSOD1 mice lived to approximately 135 days, the extra MHCI gene extended average survival to 157 days. The longest-lived treated mouse made it to 182 days. Kaspar reasoned that astrocytes must possess some sensor for MHCI, and use its input to determine whether to attack the motor neurons or leave them be. A likely candidate, according to co-author Christopher Walker, also at Nationwide Children’s, would be the so-called killer inhibitory receptors. Expressed on natural killer cells, these proteins allow the immune system to determine if a target cell is friend or foe. It is as if the NK cells are reaching out their killer inhibitory receptors for a handshake—if they find MHCI and self molecules to bind to, they leave the cells alone. If they do not, then they attack. Astrocytes do not normally express these receptors, yet Kaspar and colleagues found them in astrocytes in the spinal cords of mSOD1 mice and on the surface of the mSOD1 astrocytes they used in their co-cultures. Kaspar suspects that when these astrocyte killer receptors do not find MHCI on motor neurons, the astrocytes secrete additional toxic factors that kill them. “This is another fantastic example of how the nervous system and the immune system are closely linked,” commented Jonathan Kipnis of the University of Virginia in Charlottesville, who did not participate in the work. “We have been taught that the two systems live in isolation from each other, yet this work, as well as many other recent discoveries, suggest how closely the two systems are intertwined” (see Apr 2015 conference news; Feb 2016 news; Jun 2015 news). While Kaspar said it is too early to translate his results into a therapeutic, it does raise some ideas. Researchers might try amping up MHCI expression in the motor neurons of people with ALS, or perhaps add a decoy molecule that binds to the killer inhibitor receptors and convinces astrocytes that their neuronal neighbors are not targets. Lisa Boulanger of Princeton University in New Jersey, who was not involved in the project, praised the findings as well. She commented that the brain tightly controls MHCI expression. Overexpression can interfere with cognition and neural repair in mice (Smith et al., 2015; Wu et al., 2011). “It might be less risky to stop astrocytes from ablating neuronal MHCI, rather than directly driving up levels of MHC1 expression,” she said. These results contradict conventional wisdom about the negative impact of immune proteins in neurodegenerative diseases, Boulanger added. “In any neurologic condition where MHCI levels rise, which includes Alzheimer’s, we need to consider if the increase is helpful or if it contributes to pathology,” she said. 1. 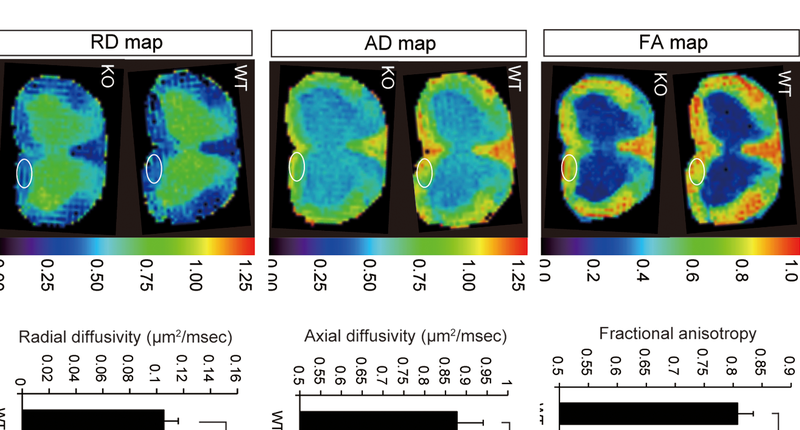 Farmer WT, Abrahamsson T, Chierzi S, Lui C, Zaelzer C, Jones EV, Bally BP, Chen GG, Théroux JF, Peng J, Bourque CW, Charron F, Ernst C, Sjöström PJ, Murai KK.Neurons diversify astrocytes in the adult brain through sonic hedgehog signaling. Science. 2016 Feb 19;351(6275):849-54. PubMed. 2. Song S, Miranda CJ, Braun L, Meyer K, Frakes AE, Ferraiuolo L, Likhite S, Bevan AK, Foust KD, McConnell MJ, Walker CM, Kaspar BK. Major histocompatibility complex class I molecules protect motor neurons from astrocyte-induced toxicity in amyotrophic lateral sclerosis. Nat Med. 2016 Feb 29; PubMed. 3. Stevens B, Muthukumar AK. Cellular neuroscience. Differences among astrocytes. Science. 2016 Feb 19;351(6275):813. PubMed.